we provide services for Refurbishing and modifications of the steam turbine. Pre-commissioning and commissioning activities of TG set and auxiliary systems, servo valves calibration, TG rolling, testing and commissioning of electrical meters, relays, protection systems, switch-gears and excitation system. To meet the various requirements of the customers, we are involved in providing Steam Turbine Maintenance Service. We are counted amongst the leading names in the industry, offering timely executed Old Steam Turbine Reconditioning Services. Our entire services are designed as per the directions of our clients and are delivered in well-defined time frame thereby rendering utmost client satisfaction. We are engaged in providing highly reliable Steam Turbine Service to the esteemed clients. Offered service is rendered by our highly skilled professionals, keeping in mind the specific requirements of our valuable clients. Offered service is highly admired by our esteemed clients for its hassle free and on time execution. 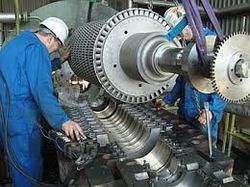 We are leading service provider for all types of Steam and gas Turbine Maintenance Services. In order to meet excellent quality standards, we are supplying Steam Turbine Maintenance Services. We are master in providing Steam Turbine Erection Service to customers. We execute services in carrying out complete Overhauls of all types of Steam and Gas Turbines for Industrial and Power Generation, including Governing System, Turbo Generators, High Speed Centrifugal Compressors, Gear Boxes and Pumps for different OEMs. Sulzer Turbo Services supports the repair, replacement of parts and complete overhaul for the power and industrial steam turbines. Our extensive facilities and experienced personnel have been offering this steam turbine service for over 30 years. Capital overhauling, Rotary renewals, AMC and Break down maintenance and Trouble shooting of Turbines (GAS & Steam) including Governing systems, Generator, Pumps, Gear boxes and Compressors supplied by any OEMs.